Hans Thoma (1839–1924), The Lauterbrunner Valley (1904), oil on canvas, 130 × 110 cm, location not known. Wikimedia Commons. This article concludes my selection of the landscape and mythological paintings of Hans Thoma (1839–1924). Prior to 1886, he had struggled to get the critical attention and patronage that he thought his work deserved. Hans Thoma (1839–1924), Apollo and Marsyas (1886), oil on panel, 45 × 55 cm, location not known. Wikimedia Commons. 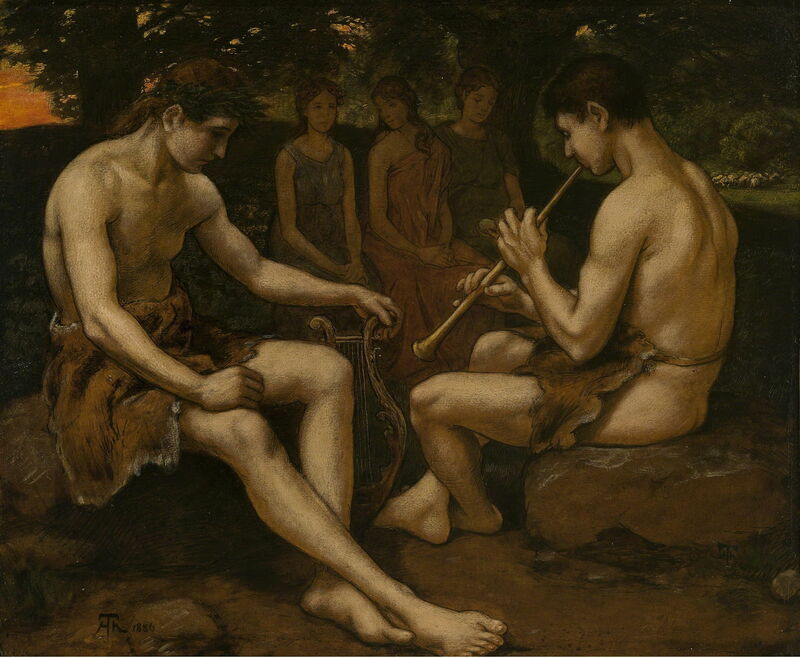 Apollo and Marsyas (1886) is his depiction of the popular myth of the contest between the god Apollo and the satyr Marsyas, playing the aulos, a type of double oboe commonly referred to as a flute (although the aulos has a reed, unlike a flute). This was judged by the nine Muses, and resulted in the horrific flaying of the satyr, a popular motif for the great classical narrative painters. I have already looked at this in my series on Ovid’s Metamorphoses. Thoma chooses to show the contest itself, with Marsyas playing, and only three of the Muses in the background. Although not a strongly narrative painting, as it makes no reference to the outcome, this was probably more appreciated by contemporary viewers. Hans Thoma (1839–1924), Eight Dancing Women with Bird Bodies (1886), oil on panel, 38 × 58.5 cm, location not known. Wikimedia Commons. 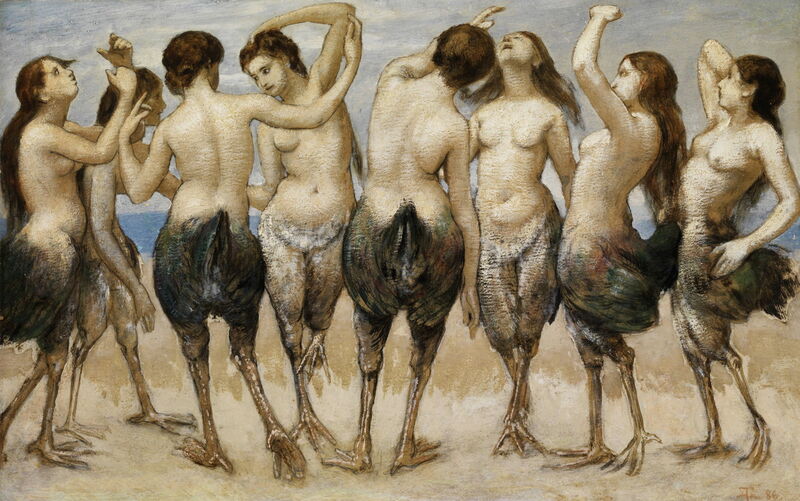 Eight Dancing Women with Bird Bodies (1886) is a more puzzling mythological painting. The best-known women with bird bodies were the Sirens, who range in number from two to five. In another painting showing the Sirens trying to lure a passing ship, Thoma paints very similar figures, suggesting that these are also intended to be Sirens. 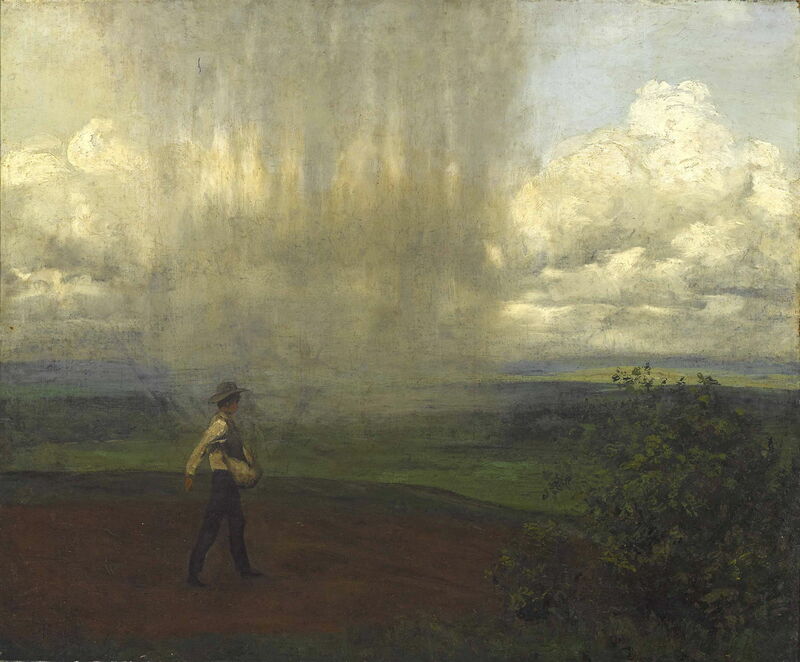 Hans Thoma (1839–1924), Säender Bauer (Heavy Shower) (1886), oil on canvas, 60.5 × 73 cm, location not known. Wikimedia Commons. Säender Bauer (1886) is, I think, best translated as Heavy Shower. A sower – strongly reminiscent of Jean-François Millet’s sowers – is at work in the ploughed field in the foreground. Beyond, the heavens have opened in a sudden downpour. 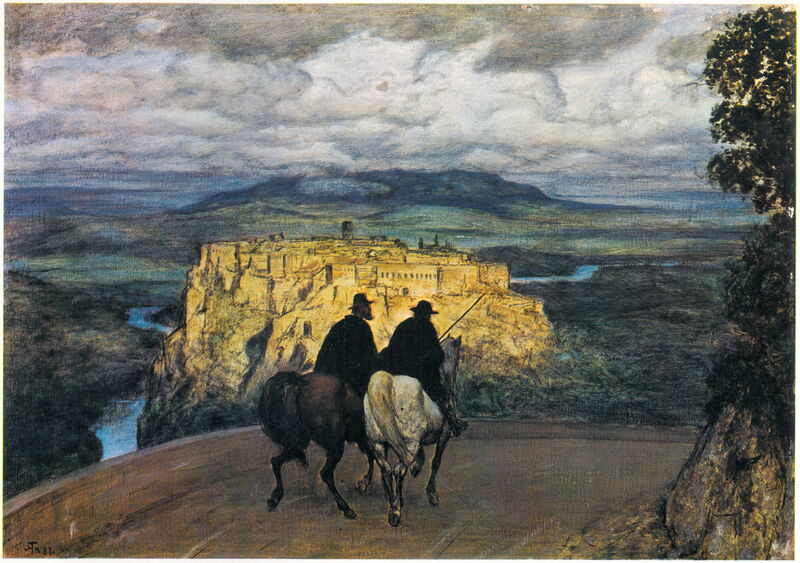 Hans Thoma (1839–1924), Erinnerungen an Orte / Reiseerinnerungen an »Orte« in Umbrien (Memories of Orte / Travel Memories to Orte in Umbria) (1887), oil on cardboard, 51.5 × 71.5 cm, Neue Pinakothek, Munich, Germany. Wikimedia Commons. Erinnerungen an Orte / Reiseerinnerungen an »Orte« in Umbrien, meaning Memories of Orte or Travel Memories to Orte in Umbria (1887), refers to Thoma’s second visit to Italy, and this ancient town about forty miles north of Rome. Two cloaked riders are silhouetted against the glowing buildings of Orte, perched on its tuff butte above the valley of the River Tiber. Hans Thoma (1839–1924), Lonely Ride (1889), oil on canvas, 74.1 × 62.4 cm, Städelsches Kunstinstitut und Städtische Galerie, Frankfurt, Germany. Wikimedia Commons. 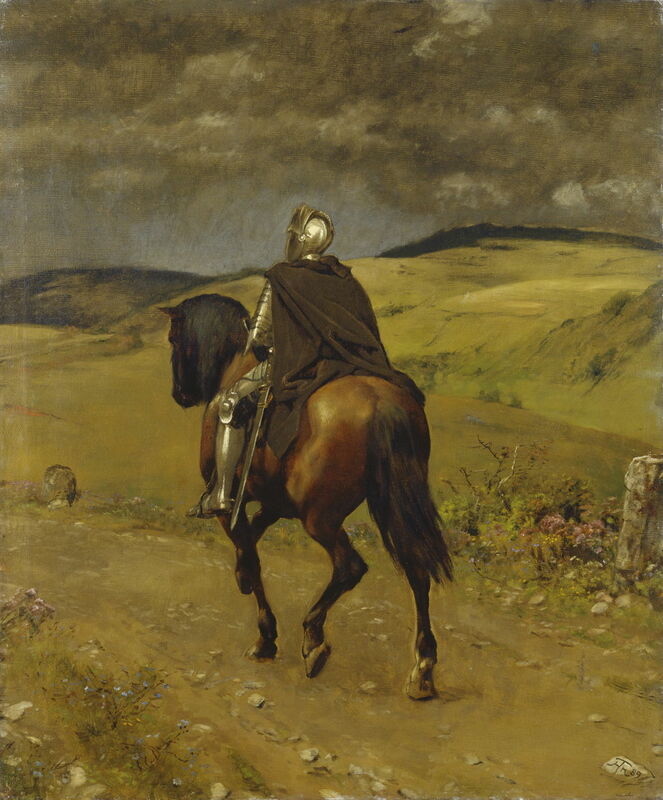 Lonely Ride (1889) shows a mediaeval knight riding alone in full armour, through rolling, hilly countryside. This and others of his paintings are strongly reminiscent of the works of those in the Pre-Raphaelite movement; I suspect that Thoma saw some when he visited Britain. In 1890, Thoma’s career was transformed by his first one-man show in Munich, which brought him critical acclaim and national recognition. For the next twenty years or so, he was ranked among the leading artists in Germany. Hans Thoma (1839–1924), Summer (Landscape near Karlsruhe) (1891), oil on canvas, 71.1 × 88.9 cm, North Carolina Museum of Art, Raleigh, NC. Wikimedia Commons. 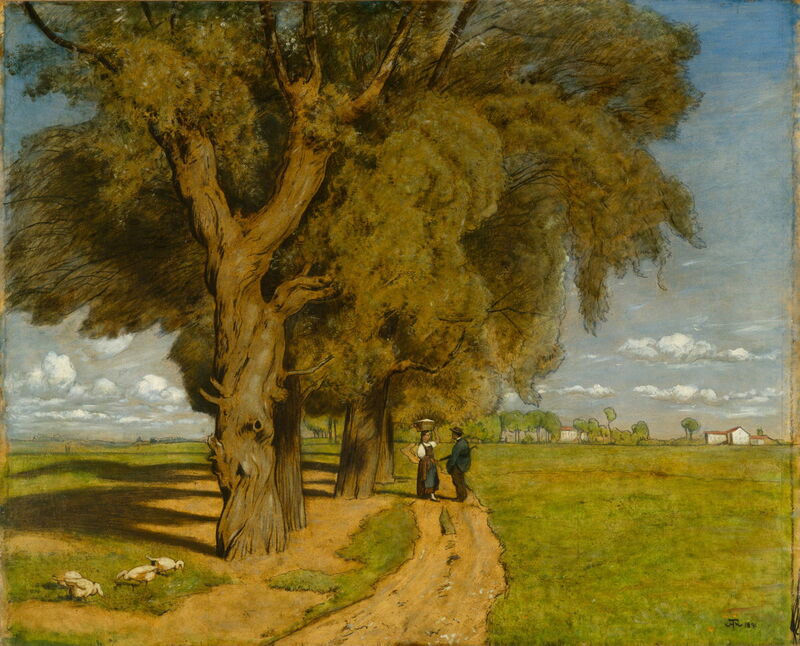 Summer (Landscape near Karlsruhe) (1891) shows a fine summer’s afternoon on a country track, on the plain which he must have known so well. 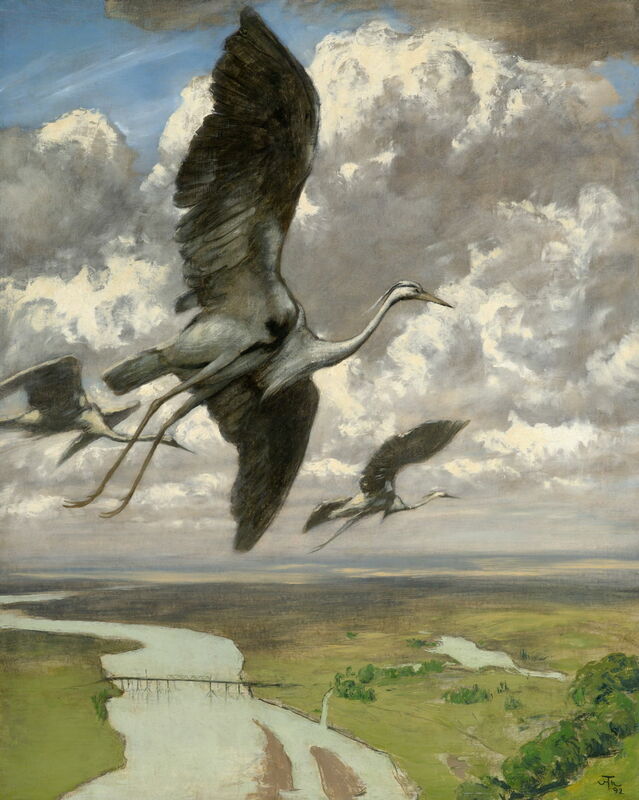 Hans Thoma (1839–1924), Wondrous Birds (1892), oil on cardboard, 92.4 × 74 cm, North Carolina Museum of Art, Raleigh, NC. Wikimedia Commons. He returned to his idiosyncratic view of mythology with this fascinating painting of Wondrous Birds completed in 1892. The birds shown here are not storks or cranes, but are based on the grey heron, a common sight across much of the countryside of Europe. There are various myths and legends associated with storks and cranes, but I am not aware of any for the heron. Hans Thoma (1839–1924), Spring (1895), oil on canvas, 113 × 87.6 cm, Los Angeles County Museum of Art, Los Angeles, CA. Wikimedia Commons. 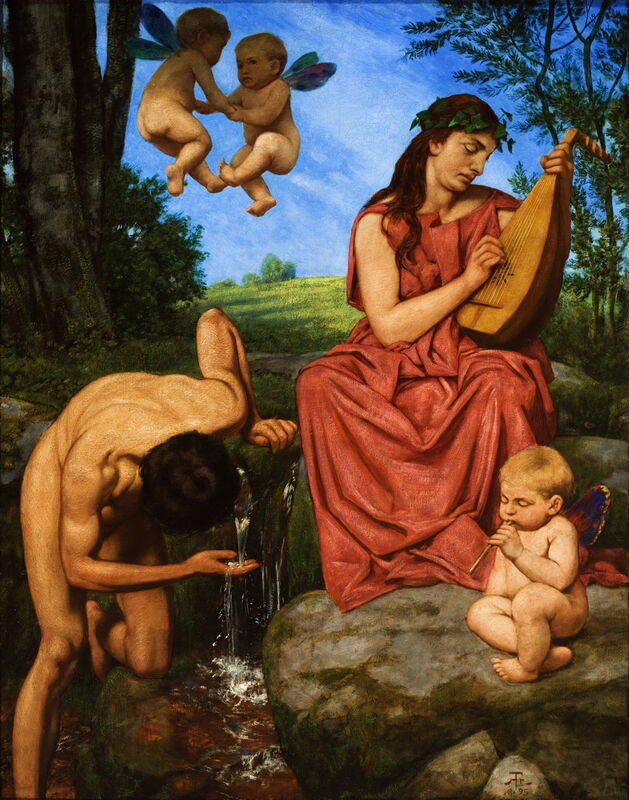 Spring (1895) refers not to the season, but to the source of water shown here (in German, Die Quelle, the source). Thoma avoids the conventional classical treatment with an old river god, but shows a young man slaking his thirst. The woman with the lute could perhaps be a water nymph, or Naiad. Hans Thoma (1839–1924), Spring Fairytale, An Allegory (1898), oil on canvas, 120 × 75 cm, location not known. Wikimedia Commons. 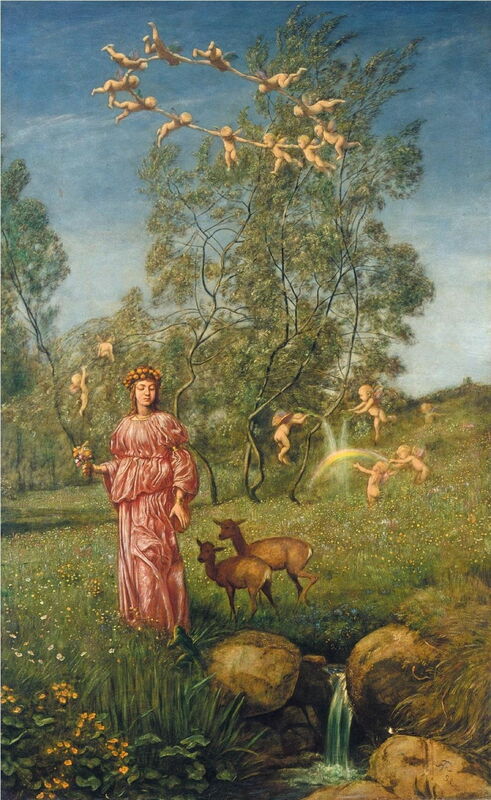 Thoma is referring to the season in his Spring Fairytale, An Allegory (1898), which shows a woman who may have been influenced by the figure of Flora in Botticelli’s famous Primavera (c 1482). She is surrounded by meadow flowers, two small fawns, and sundry winged putti. Thoma seldom if ever depicted his putti with bird-like wings, but seems to have preferred the more unusual insect or butterfly wings, with their rich colours. By 1899, Thoma was associated with the Kronberg artists’ colony, and could afford to move his family into an apartment with its own studio near to the Schloss Friedrichshof in Kronberg im Taunus, just outside Frankfurt. Thoma was appointed professor at the academy in Karlsruhe (to the south of Frankfurt), and director of the Kunsthalle in that city – posts which he held until he retired in 1920. 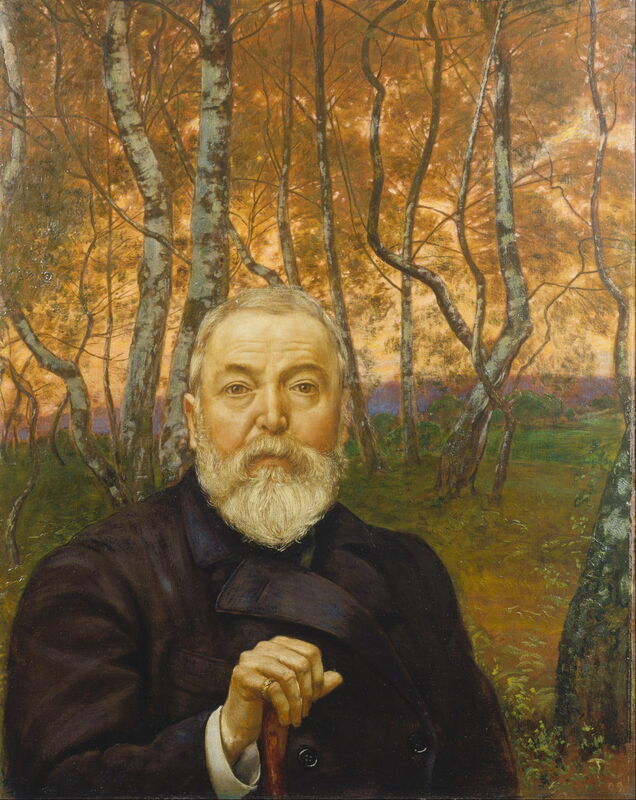 Hans Thoma (1839–1924), Self-portrait in Front of a Birch Grove (1899), oil on canvas, 91 × 75.5 cm, Städelsches Kunstinstitut und Städtische Galerie, Frankfurt, Germany. Wikimedia Commons. Thoma’s Self-portrait in Front of a Birch Grove (1899) is his best-known self-portrait, and probably marked his sixtieth birthday that year. Hans Thoma (1839–1924), The Lauterbrunnen Valley (1904), oil on canvas, 130 × 110 cm, location not known. Wikimedia Commons. 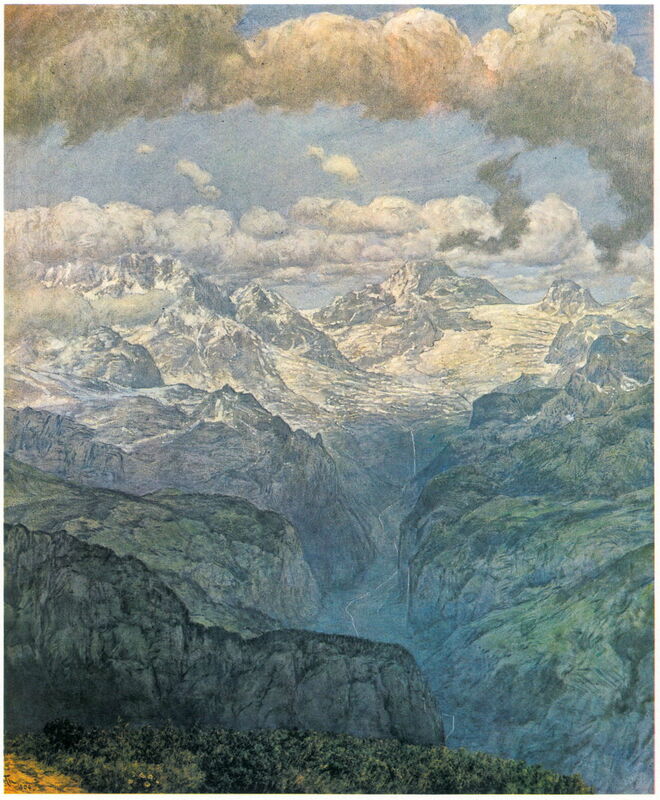 The Lauterbrunnen Valley (1904) shows one of the deepest valleys in the Swiss Alps, a gorge which travels five miles up to spectacular Staubbach Falls, with the Eiger and other peaks beyond. This superb landscape view reminds me of the popular paintings of the Pyrenees and Alps by Gustave Doré. From 1905 to 1918, Thoma served in the upper chamber of the Baden State Parliament. 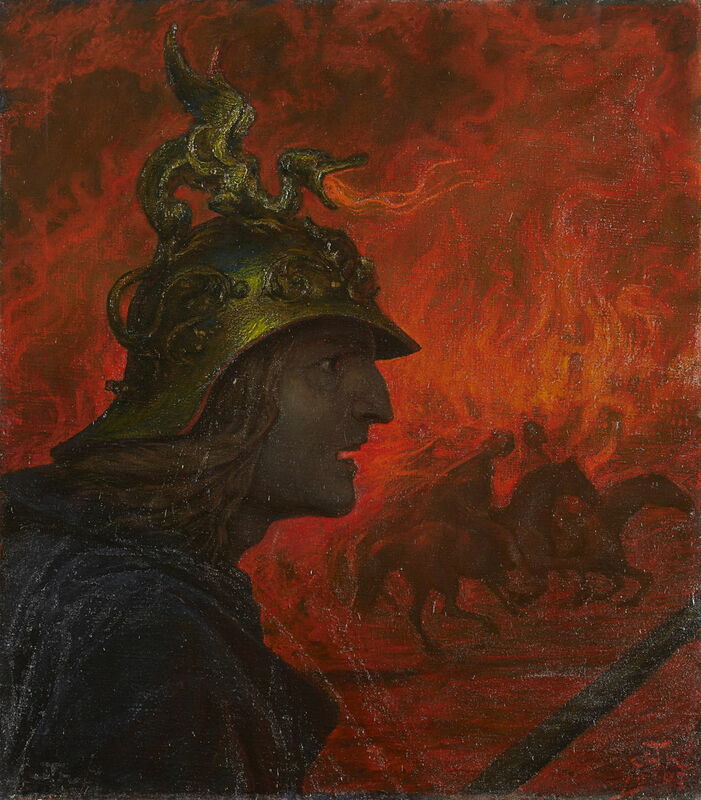 Hans Thoma (1839–1924), War (1907), oil on canvas, 72 × 64 cm, Städelsches Kunstinstitut und Städtische Galerie, Frankfurt, Germany. Wikimedia Commons. Prior to the First World War, Thoma, like many German artists of the day, was strongly supportive of the militarisation of Germany. His painting of War from 1907 thus seems strange, with its bleak apocalyptic vision. Hans Thoma (1839–1924), Spring Melody (1914), oil on canvas, 101 × 76 cm, location not known. Wikimedia Commons. 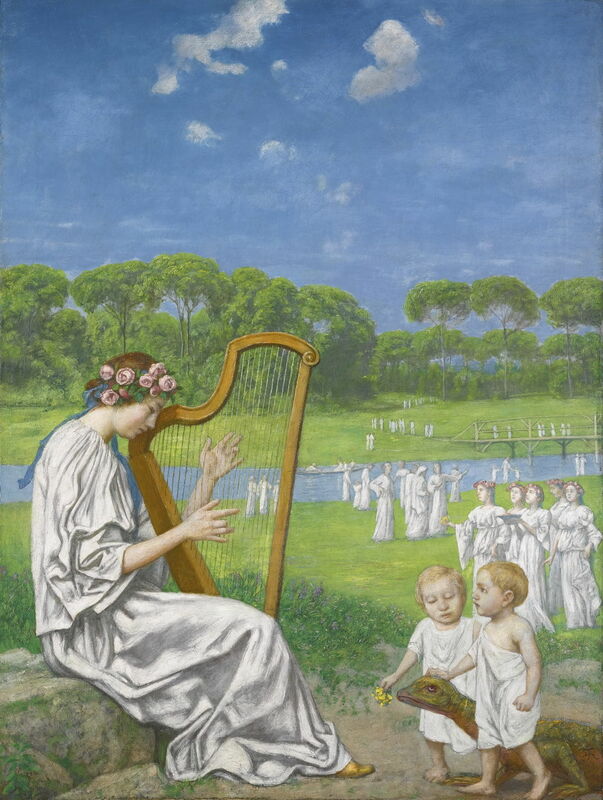 In the year that war broke out, Thoma painted Spring Melody (1914), which could readily be interpreted as an idealistic longing for peace, rather than a nationalistic statement. 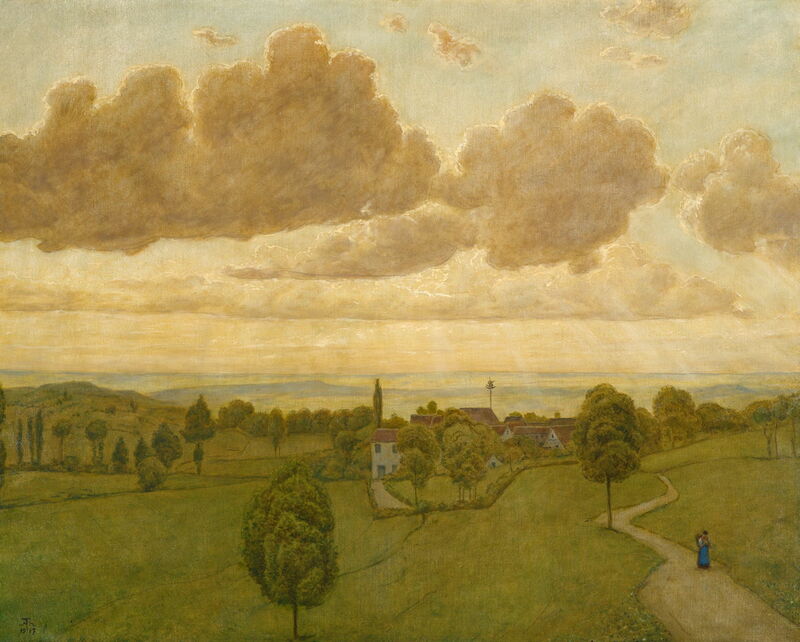 Hans Thoma (1839–1924), Landscape (1917), oil on cardboard, 80.3 × 100.3 cm, North Carolina Museum of Art, Raleigh, NC. Wikimedia Commons. Thoma continued to paint through the war, and completed this Landscape in 1917. Then in his late seventies, this almost deserted view expresses a tranquillity which must have been wishful thinking at the time, and remembrance. His eightieth birthday in 1919 was marked by a celebration organised by Ernst Oppler and Lovis Corinth. He died five years later, in 1924. Posted in General, Painting and tagged Corinth, landscape, myth, painting, Thoma. Bookmark the permalink. That said, it’s a reference later obscured by associations with the Phoenix, so the artist may have been unaware. Thank you – that is very interesting. They are strikingly large and beautiful birds too.